Nostalgia is a very powerful tool, especially when it comes to games. 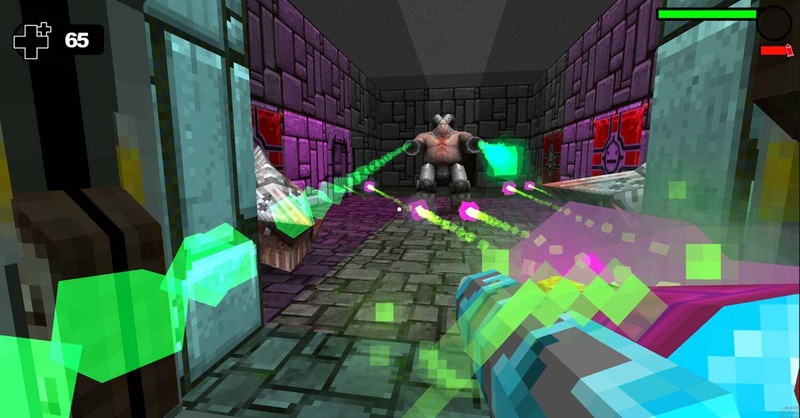 Gunscape merges the first-person shooter elements of old ’90s titles like Quake and Doom with the highly functional world-building tools of Minecraft. An expansive tool-kit at its heart, Gunscape cleverly pulls on some of your fondest gaming memories while handing you all the components necessary to produce your very own experience. You don’t necessarily play this game, you make it. Stick with us here. Gunscape doesn’t simply boot up a blank screen and expect you to do all the work. There’s a very basic story mode available to get you climatized to what it’s all about. This is a very bare bones experience as far as narrative goes; your only source of information is a rude computer terminal after all. 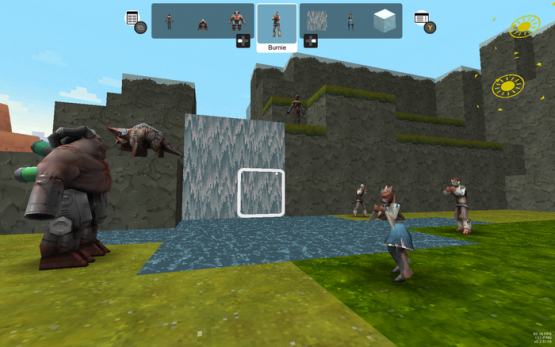 You’ll explore the realms available in the creator kit, ranging from the Nazi castle (ahem, Wolfenstein) to lush, blocky and dinosaur-filled forests a la Turok. The story is more a showcase of what you can achieve with the expansive toolkit rather than any sort of driving force, it serves more as inspiration than a gaming experience. If you’re looking for a story-driven yet retro experience this is most certainly not going to be your cup of tea. Moving swiftly away from the “story” mode, Gunscape’s true purpose becomes apparent. This is a very broad but highly accessible world builder with a focus on building either your own stories or multiplayer arenas. The array of options available to you are staggering and rather intimidating to begin with. It’s a serious kid in a candy store situation; you’ll want to throw everything down all at once. A slow, steady and methodical approach to construction will pay off handsomely here, though. The wide array of materials is thematic, following aforementioned inspirations from popular titles of old. Mix them up for a truly unique playscape – think dinosaurs running around Tron’s Grid – or work hard to honorably recreate your favorite level with your own twist. It’s entirely up to you. Instant gratification, at least beyond spawning a dozen giant mechs, is in short supply. Building an environment takes time and a thoughtful approach, but the payoff is well worth the effort. The builder is fantastically simple, mimicking Minecraft admirably, and this simplicity is where the real joy from Gunscape is gleaned. Custom map building is a staple on PC but still a rarity on the home consoles, at least in comparison. This is predominantly down to the lack of control delivered via controllers when up against a mouse and keyboard, Gunscape manages to ignore this norm entirely. Its builder is functional and effective, feeling smooth and manageable at all times which help to keep things highly accessible and surprisingly fun. It’s not going to win any awards for good looks as Gunscape honorably harkens back to the games it’s inspired by, block textures and all. It works perfectly for Minecraft and isn’t a problem in the slightest here, it actually adds to the whole vibe and suits the eccentricity of what you can build brilliantly. It’s also probably somewhat key to it remaining functional, a high fidelity builder would likely play havoc with the PS4’s architecture once you pass a certain point (Fallout 4’s settlement limit is there for a reason) but Gunscape’s basic cosmetics enable a far superior build limit. Leaving things down to your imagination more than the restrictions of technology is important in these kind of games, it’s odd that LEGO has basically been digitized but the emotions those blocks used to evokes are still very much present. Once you have a few custom maps under your belt, the next cool feature of Gunscape comes into play. Sharing. There’s a large community behind all the tools, producing their own handiwork, which is all shared on the main menu along with the typical editors picks and such. This feels very LittleBigPlanet and works just as well. Obviously we played an early code so the community isn’t as active as it will be post-launch, but even then we had little trouble jumping into other people’s creations. It’s great seeing what other people come up with and works to further inspire you when you embark upon your next big build. Better still, Gunscape supports both local and online split screen multiplayer so if you can’t find a busy environment call up your friends or power up a second Dualshock 4. 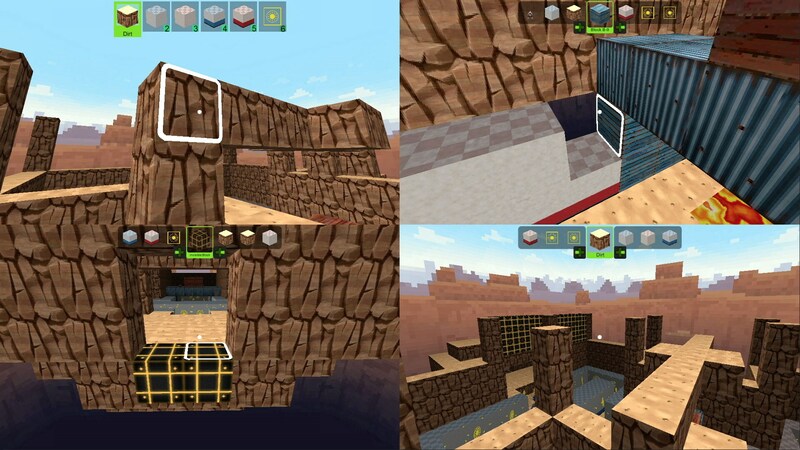 You can even split screen building mode, working as a team to create something really special, putting somewhat of a whole new spin on team building. Seriously though, this is a rare but very welcome move suiting the tone perfectly, further echoing the traditional tropes of the ’90’s (they were so good for gaming, weren’t they?). As playable story chapters can be created in addition to multiplayer battle arenas, the amount of things to play is technically infinite, as long as the community continues to contribute, that is. The community and its share functions open the creative floodgates in the best way possible, working to avoid a lack of fresh maps to play. Guaranteeing fun worlds via featured picks and a filter that helps narrow down your search to specific modes helps the community area feel welcoming and constantly current. Best of all, in the unlikely event you can’t find anything you fancy, just build it! It’s a community that’s only going to get better when it becomes more populated as time goes on, sharing is caring after all. 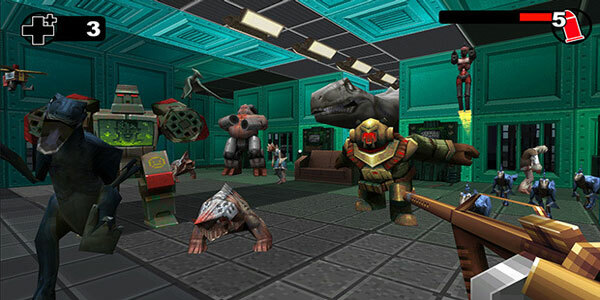 For those that miss the ’90s and its truly classic FPS titles, then Gunscape is going to be a real treat. The builder is easy to use and offers a pleasantly nostalgic array of materials that are really only limited by your imagination, as cliché as that sounds. The story is poor beyond belief, but works well enough to inspire creativity and showcase the tools at your disposal. It’s a very niche title that’s not going to appeal to those looking for a plug in and play experience, but for those looking to sink some methodical hours and create something unique, it’s an undeniably effective tool that’s as functional and rewarding as it is nostalgic. Gunscape review copy provided by publisher. For information on scoring, please read our Review Policy here.